Wyoming Honor Conservation Camp is located on state land north of Newcastle Wyoming. This facility holds approximately 230 male inmates and has a secured Boot Camp building, which holds an additional 50 inmates. The Boot camp is a 180 day program that is highly structured for offenders under the age of 25. All inmates in the boot camp can graduate the program with their GED. 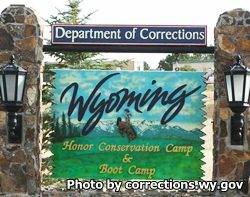 Additionally, Wyoming Honor Conservation Camp offers a Forestry Program that works in conjunction with the Wyoming State Forestry Division and employs around 60 inmates. They provide various community service jobs, including labor for federal projects, forestry projects and firefighting projects. General Population Visitation on Friday is between 5:00-7:30 pm. Check-in for visitation is between 4:45-5:15 pm. General Population Visitation occurs on Saturday, Sunday and Holidays between 1:00 pm-7:30 pm, check-in is between 1:00- 5:30 pm. Boot Camp Visitation is on Sunday only between 10:30-12:30 pm, check-in between 10:15-10:45 am.